Have you ever seen an otter? A few weeks ago was the first time I had the joy of watching not one, but TWO in action. It was delightful. My neighbor, a southern Californian who loves her visits here in her vacation home that I sold to her and her husband this spring, was on the phone with me, when suddenly in excited tones she exclaimed, “There’s an otter right in front of my dock!” I immediately grabbed my binoculars and just in time, because she told me it was heading my way. One turned into two and they were slipping in and out of the water as if they were playing Tag-You’re It…but as I found out only seconds later, they were hunting for fish. One came up with a cutthroat trout in its mouth and to my delight, turned towards me to juggle it into its mouth and then downed it in two chomps. This is a memory that will always stay with me as I’d heard that we had otters up here, but hadn’t seen any in the 7-8 years we’ve owned property up here. My neighbor was able to barely catch this photo a couple of days later just before her dogs barked and it disappeared under the water. 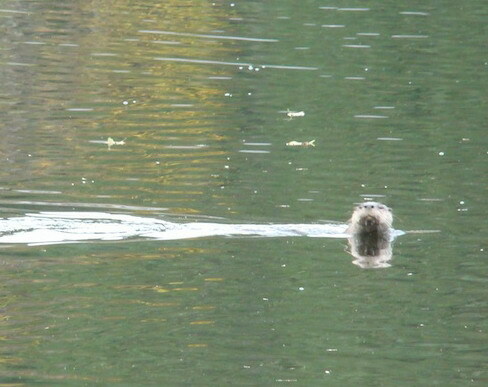 This river otter, its scientific name Lutra Canadensis range in size from 3-4′, which includes its 12-18″ tail. They are quite large in the water, weigh from 15-25 lbs. and are part of the weasel family. Their favorite food is fish, but they will also enjoy frogs, turtles, snakes, rodents, crayfish (which we have here), etc. I’ve heard the sound they make while their heads are above water, and just before I realized what it was, I thought it was a beaver with an asthma condition! It was snuffling along heading towards us just after we’d been on a boat ride with an artist and his wife, Jeffrey Hull, from Cannon Beach. He quickly tried to grab his camera, but the critter submerged and it was too late to get a shot. I’ve read that they are solitary creatures except when they pair up for mating, so I might have gotten to see something special just before they mated…you never know! We have just recently moved onto the lake and what a glorious time, with the changing of the seasons, the stupendous colors and nature’s daily show for my husband and me to parktake in. My husband’s favorite scene: early in the morning, when the water’s completely glassy and is a mirror image of the landscape surrounding it. Another set of lakefront experiences we’ve enjoyed is watching the set of birds that are alighting on the lake before heading off to parts unknown. 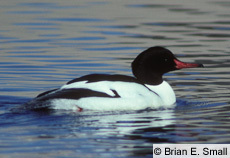 The Bufflehead has been a striking black and white bird, with a roundish head. It’s the smallest diving duck in North America. 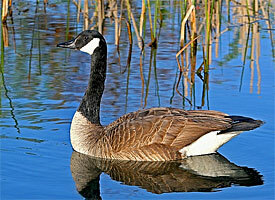 I’ve seen both males and females, the female as usual being the understated version of the male as seen below. We’ve also had Canadian Geese and I’ve seen them around here sporadically for years, with one who either ended up lost or “widowed” and has wintered here alone. 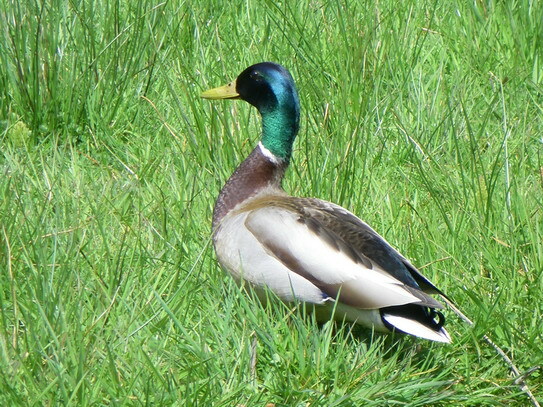 We’ve had Mallards and pairs that stick around through the seasons and mate. Sometimes the small ones make it, sometimes they don’t. 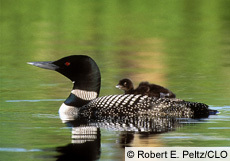 Mergansers and loons are another type of duck or waterfowl that has shown up here in our slice of paradise. This time of year while bringing loads of rain, also brings a nice treat to those of us who get to be here for the annual salmon spawning that occurs in several of our creeks and at the fishladder located at the southern end of our lake on Northshore Drive starting approximately in November and going through the winter season. 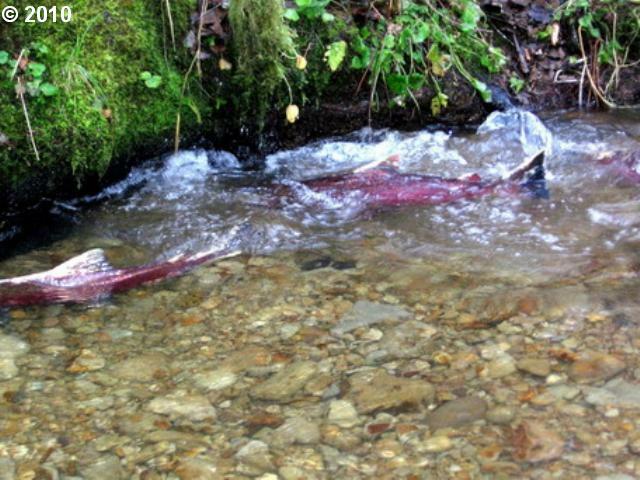 It’s really something to watch their struggle to make it upstream to their spawning grounds and they can be prolific some years, as in the season of ’09-/10 when they were seen clear into March of 2010. You can stand on the banks and watch dozens of them in the creeks. I’ve gotten a few close-up photos in years past. 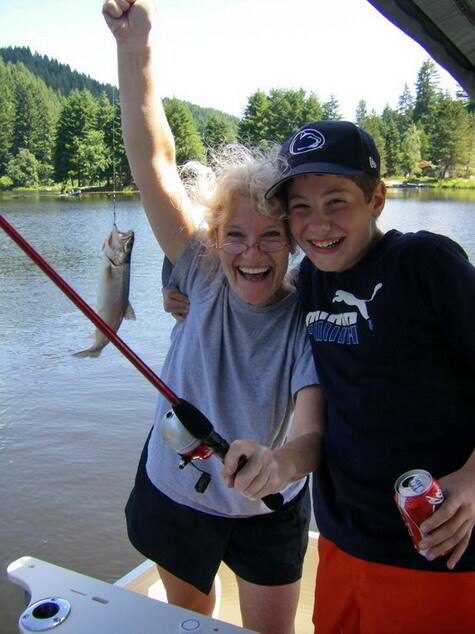 This entry was posted in Nature and tagged autumn at the lake, cutthroat trout, ducks, fish, otters, salmon, waterfowl, Wildlife. Bookmark the permalink.